Once again I accompanied my old buddy John Woodyard in his decades-long quest to hike the Appalachian Trail one section at a time. A couple years ago we hiked together in southern Vermont. Before that, I joined him on the 40-mile section of the AT between the Connecticut River and Sherburne Pass. This time we started at Route 25 in New Hampshire and hiked south to the Connecticut River. It was a tough hike with plenty of elevation change. Originally we had planned to do it in 4 days, but soon found out that we needed more time. With a bad right knee making it hard to train, John wasn’t in as good a shape as he usually is. As for me, well, I’ve never been a strong hiker, and my sedentary bookselling lifestyle isn’t helping matters. Whatever. We shouldered our backpacks and did the 46 miles in 5 days. Not bad for a couple of 60-somethings. While we were on the trail, about a hundred northbound thru-hikers in great shape blew past us with little effort – a few of them being our age. That psyched us out. We kept telling ourselves that for every thru-hiker whizzing by, another ten had left the trail between here and Georgia. Still we huffed and puffed uphill, grimaced at our joint pains going downhill, and sweated all day long wondering why we had let our bodies go. It’s hard, sometimes, to keep from comparing yourself to others. John will be back, I’m sure. He has hiked three-fourths of the AT so far, and is not the kind of guy to be satisfied with that. 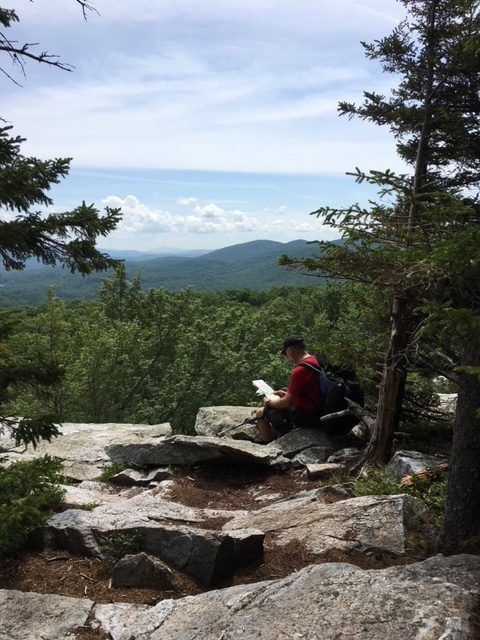 He still has the better part of New Hampshire’s White Mountains to do, along with most of the Berkshires is western Massachusetts. So he’ll be asking me to join him for another leg, no doubt. I’d better be ready. For six years I made excuses before getting back on the trail with my old hiking buddy, John. It’s shameful, really. No one is that busy. But at long last we met in Manchester, shuttled cars, then set foot together on the white-blazed AT/LT, headed north. 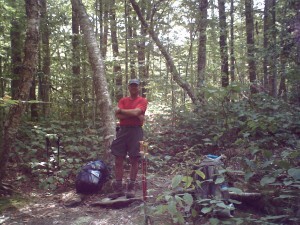 John is section hiking the Appalachian Trail. He has done 70% of it so far. Six years ago, I did a 40-mile stretch in central Vermont with him, then shuttled him south so that he could do another section alone. This time I joined John for 19 miles, between Kelly Stand Road and Route 30. I didn’t think my flabby body couldn’t handle more than that. I set aside 3 days from my allegedly busy life to do it. We went up over Stratton Mountain first thing, tracing the same route that I had hiked with my grandkids a month earlier. A steady rain kept us cool and John let me set the pace. As a result, we got up and over the mountain with little difficulty. We talked our way through the first day and into the next. We talked and talked. Six years is a long time. We had a lot of catching up to do. After spending a night at Stratton Pond Shelter, I was feeling pretty spry for a 60-year-old. I suggested that we push it all the way to Route 30 the second day instead of going just to Spruce Peak Shelter. That way he could get in a full day’s hike the third day. John thought it best that we go as far as Spruce Peak Shelter before making that decision. I agreed. Our traverse through the dripping forest was a trip down memory lane for me. We skirted the edge of Lye Brook Wilderness where I’d spent some time alone some years back. Then we stopped for lunch at Prospect Rock. I had stopped there 21 years earlier while thru-hiking the Long Trail. This time John and I cooled out while watching clouds gather slowly over Manchester below. A pleasant break, indeed. 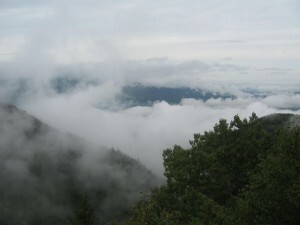 Sure enough, I was still feeling strong when we reached Spruce Peak Shelter early in the afternoon. With only 3 miles left, we went for it, popping out on Route 30 with plenty of time for a 2-hour drive south into Massachusetts. We parked my car at Dalton then hiked half a mile south on the AT to Kay Wood Shelter. There we stayed for the night. In the morning we retraced our steps back to my car where John picked up a 5-day supply of food before continuing north all the way to his car on Kelly Stand Road. That was two days ago. Since then John has been hiking over Mt. Greylock and I have returned to my busy-ness. John and I have been having outdoor adventures together since we were Boy Scouts back in Ohio. We’re not done yet. Next year, I’ll join him on another tramp along the AT. No excuses. I’ve got my priorities straight now… and a year to get myself in shape so that I can stay on the trail with him longer. John Woodyard and I traded emails back and forth all summer long, putting together a plan to hike a section of the Appalachian Trail here in Vermont. Last Sunday morning, we met at the motel in Rutland where he had spent the night after a long drive from Ohio. Then we parked one of our cars at Sherburne Pass, drove to Norwich, and started walking. We hiked over the many ridges and foothills between the Connecticut River and the main spine of the Green Mountains. We hiked forty miles in four days – not a particularly challenging hike for John but a real workout for me. Then I drove him to another trailhead where he commenced the second leg of his hike while I went home exhausted. Forty in four was all I could handle. I knew that from the very beginning. I’m soft and fat from too many years in front of a computer screen and not enough exercise. John also works on a computer, but he jogs on a regular basis so he’s in better shape than me. We’re both in our mid-fifties. 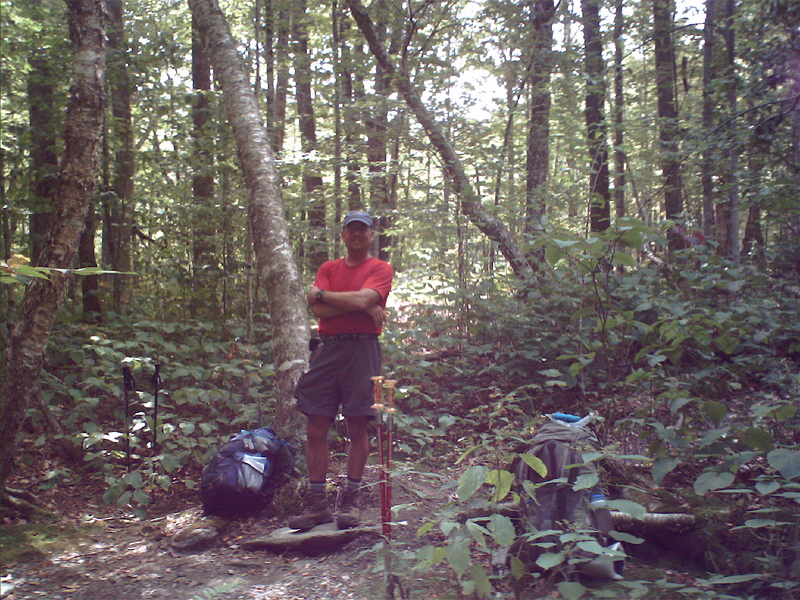 John has been biting off big chunks of the Appalachian Trail for a couple years now and could possibly hike the whole damned thing by the time he reaches retirement age. I have no desire to do that. All the same, I’ll probably accompany him on several of his New England outings. I enjoy hiking with a friend every once in a while. For me it’s a different way of being in the woods: more social, less pensive. And different can be good. Trail pounding isn’t my preferred way of being in the woods. I’d rather wander around aimlessly for a while then land in some remote place to sit and groove on the wild. I thoroughly enjoy this comfortable philosopher-in-the-woods routine. But sometimes hiking hard is just what the doctor ordered. Burn that fat, build some muscle, and stave off the inevitable decline of old age a while longer. Besides, it’s good to step outside of the comfort zone on occasion. Different can be very good. Then there’s friendship, which has its own value. John and I have known each other since Boy Scouts. We’ve been hiking together for decades – sometimes with multi-year gaps between hikes. It’s all too easy to lose touch with old friends. The years pass quickly and everyone is so busy. Trail pounding is hard, but maintaining friendships is harder. No, hiking hard isn’t my first choice, but any way of being in the woods is a good way. As different as John and I are – the contemplative writer/philosopher and the go-getting electrical engineer – this is a point upon which we thoroughly agree. Sometimes it’s best to put everything else aside and get into the woods any way you can.